Driverless cars aren't really driverless, they just place artificial intelligence (AI) in the driver's seat instead of a human. The development and training of that artificial intelligence is the lynch pin that every autonomous vehicle program hinges on, and GM Cruise, also known as Cruise Automation, is General Motor's contribution to this crowded field. GM Cruise has test vehicles on real city streets in several different states, including complicated urban environments like San Francisco, and plans for fully driverless vehicles that won't even have traditional steering wheels or pedals. In addition to supplying driverless car technology for General Motors, GM Cruise is also committed to providing driverless car technology to Honda. Why Is GM Developing Driverless Cars, and Who Will Use Them? The main reason that GM is developing driverless cars is that this technology is seen as the way forward. Every major automotive manufacturer either has an internal driverless car program, has partnered with a third party, or has outright purchased some type of artificial intelligence-focused company. The reasoning behind driverless cars is primarily related to safety, because so many fatal accidents can be traced back to simple human error. If a company like GM Cruise can build an artificially intelligent vehicle that's smart enough to avoid those errors, the technology could potentially save more lives than a crucial automotive safety technology like seat belts. From the perspective of a driver, the primary benefit of an autonomous vehicle is convenience. Since these vehicles are capable of operating without human input, drivers could use their daily commutes to perform useful tasks like catching up on the news or email, preparing for work, or even eating breakfast without endangering anyone else on the road. In a similar vein, driverless cars will open up a whole new world of autonomy for elderly drivers and people with disabilities or injuries that would otherwise make it difficult or impossible to operate a vehicle. In some states, it's even legal for children as young as 13 years old to ride unsupervised in an autonomous vehicle. Learn which states allow driverless cars. Automakers like GM have also shown interest in leveraging their driverless car technology in the transportation and ride sharing spaces. 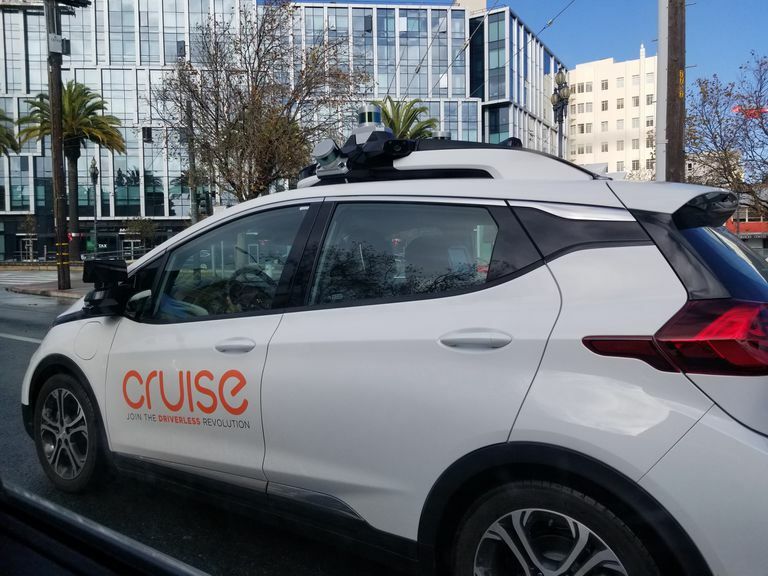 GM Cruise operates a driverless ride sharing network for San Francisco-based employees, and competitors Waymo and Uber have both shown that driverless cars could operate in a larger ride sharing network that's open to the public. Ford, with their Argo AI-powered driverless cars, has also shown how autonomous cars and trucks can be used to make deliveries for companies like Postmates and Walmart without the need for human drivers. What is GM Cruise, and Where Did it Come From? General Motors is no stranger to the field of driverless cars, and the company had self-driving test vehicles as far back as 2011. Established tech companies like Google as well as upstarts like Uber have outpaced GM in more recent years, so they looked to bring in some kind of outside expertise. GM Cruise was founded in 2013 as Cruise Automation and their early work involved the design and sale of a self-driving conversion kit for the Audi A4 and Audi S4. Another early project involved the conversion of a Nissan Leaf into a driverless car using their autonomous vehicle technology. General Motors purchased Cruise Automation in 2016 to bolster their driverless car efforts. Now known as GM Cruise, the subsidiary switched focus to adapting their technology to various GM platforms. Honda has also invested in GM Cruise, paving the way for the same basic driverless car technology to appear in both GM and Honda vehicles. How Do GM Cruise Driverless Cars Work? GM Cruise driverless cars use a variety of sensors, including radar, LIDAR, and cameras to provide information about the external environment to a specialized artificial intelligence. The AI then taps into various systems, including the throttle, brakes, and steering, to fully control the vehicle. Artificial intelligence is key to the safe operation of a driverless car. The AI is trained through machine learning to achieve a high degree of expertise on closed test courses, and then undergoes additional testing and learning on real city streets under the supervision of human safety drivers. Initial driverless car systems, including Cruise Automation's original Audi conversion kit, were focused on highway driving. Competing systems, like Tesla's Autopilot, also excel at highway driving. As it turns out, AI-powered driverless cars have a whole lot more trouble in complex urban environments than they do on the open road. That's one of the reasons that much of GM Cruise's testing has happened in San Francisco, and it's also why that car's AI has seen additional testing and training in diverse driving situations in Michigan. Basic driverless cars, including GM Cruise's test vehicles, require human supervision and include standard controls. However, GM Cruise has plans for fully autonomous vehicles that won't include steering wheels, pedals, or manual controls of any kind. Vehicles like these require a massive amount of test data and confidence in the artificial intelligence. Many of the technologies that power GM Cruise driverless cars have been around for a while, including a lot of Advanced Driver Assistance Systems (ADAS) like adaptive cruise control and lane-keeping systems. The powerful AI developed by GM Cruise taps into the types of sensors and controls afforded by these older systems, along with brand new technologies, to fully automate the driving experience. In addition to GM Cruise's driverless cars, GM has also implemented the same basic technology into their Super Cruise system. This system is similar to Tesla Autopilot, in that it taps into existing systems like adaptive cruise control, and drive-by-wire systems like electronic throttle controls and electronic steering, to automate highway driving. While Super Cruise doesn't turn a vehicle into a true driverless car, it is capable of taking over, and operating under the supervision of the driver, once the vehicle has reached a highway.